The best hostel! Such a great atmosphere and vibe. Staff is friendly and helpful. The rooms are clean, big lockers, plus a shelf in your bunk for extra storage. Every bed has curtains for privacy. The rooms have aircon that you can control 24/7. Nice bathrooms. Free filtered water. And the pools are amazing. Definitely will be back! Great friendly staff and atmosphere with free breakfast and family dinners. Thank you I had a great time. I had a short but pleasant stay at the hostel. The facilities were very nice and the staff was very accommodating. Hands down the best hostel I’ve stayed at. Loved my time here. Good “poshtel.” They have a free drinking water dispenser, and on Sunday evenings there’s a free barbecue (with veg options!). The cafe serves good food for a good price as well. Beds are very comfy with curtains, and bathrooms are clean and have rain showers. The lockers are big enough to fit your whole backpack. Overall a very nice hostel! The hostel itself is beautiful. There's a ton of social travelers here and it's really easy to meet people. It's a bit of a walk to the beach but doable. 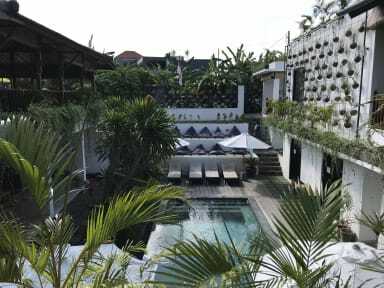 Basically, it's just up the road from the heart of canggu. They also played really good music by the pool!